Now that the embroidery has been completed for this small yoke, I was in a hurry to place it on the tunic fabric to see how it looked, LOL! The tunic fabric is upside down in this picture. I noticed it only when I was writing this post. Nothing can be done now, At least the tailor stitched it properly. Not a good picture though. I noticed that the space between the motifs required some adornment, so I stitched two big sized mirrors there. I am yet to wear this tunic. After doing a lagartera embroidery on a blouse for someone else, I thought I would do a similar geometrical pattern on one of my tunics too.this I worked in phulkari embroidery, with mirrors. After working the surface satin stitches with orange colour silk thread, I moved on to green colour thread. Now for the main colour, maroon are very dark red colour silk thread. This thread was used for the fern stitches and outlining other satin worked spaces. The embroidery was completed at this stage. On my next post, the mirrors and the completed tunic. 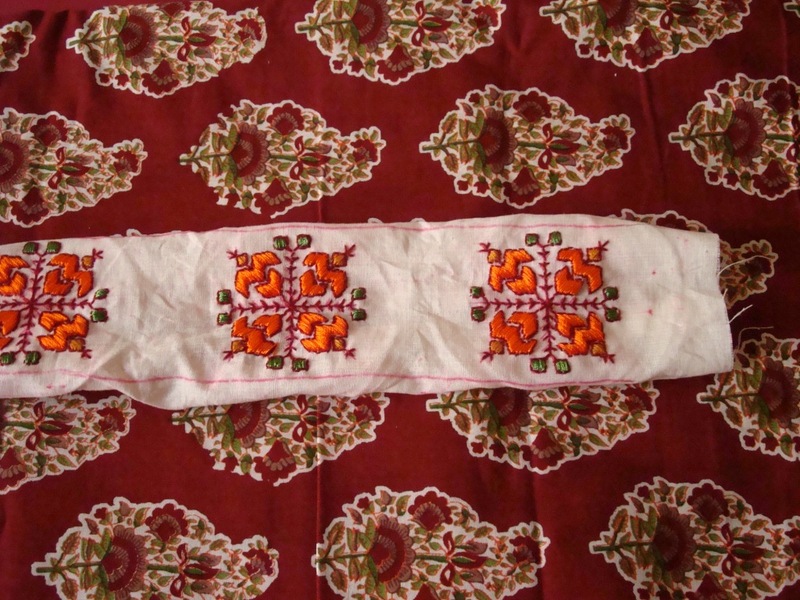 In this phulkari embroidery yoke, I worked with silk threads. For the mirror work alone I used stranded cotton. After working the small corner squares in yellow , the pattern on the squares are worked in orange colour silk thread. The motif can be used for lagartera embroidery also, with the back stitches. The rest of the embroidery details on my next post. 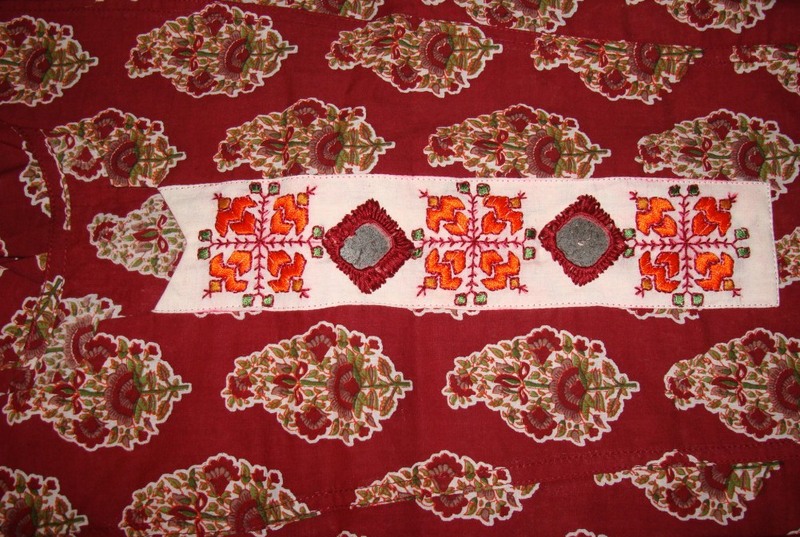 This handloom cotton in maroon is block printed with cream motifs. The pattern on the fabric itself was fine to be worn without any embellishments. 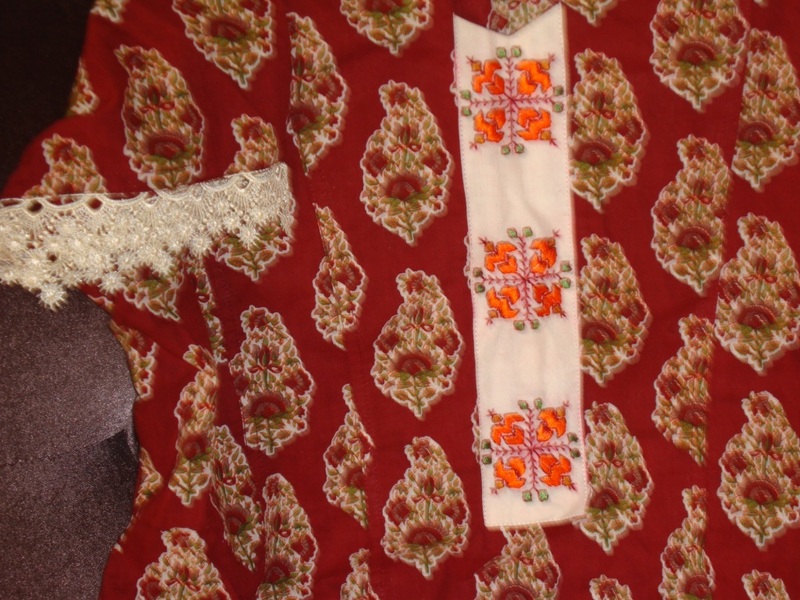 Then I had the idea of working a narrow yoke with simple phulkari motif. if any body is interested in the pattern, I can upload it after detailing the yoke. the yoke with the first colour, golden yellow.